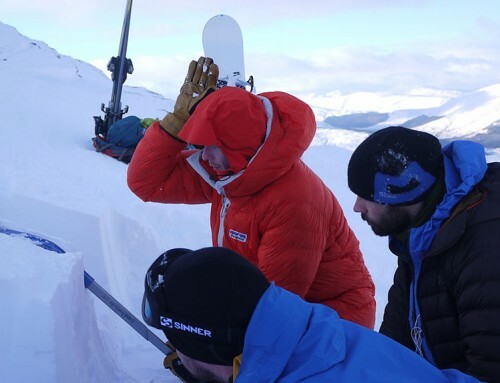 Who is the Scottish Winter Skills Week course suitable for? 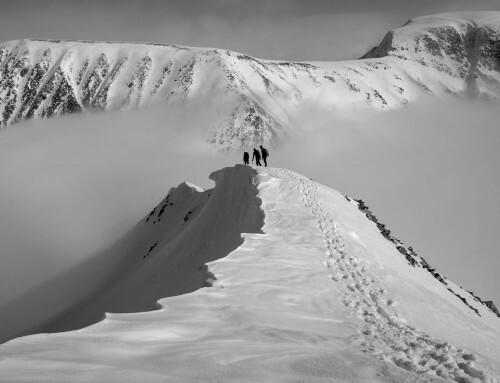 Learn all the skills necessary to travel safely through UK mountains in winter, focusing on giving you the confidence to venture out independently and avoid being another avalanche statistic! The ideal course for beginners and those keen to brush up on winter skills for hill walking and graded winter climbs. The course is also ideal preparation for overseas mountaineering trips to the Alps, the Himalaya or other similar adventurous locations. The normal 1:6 ratio allows us to give each client proper personal attention and allow you achieve far more during the Scottish Winter Skills Week. What does the Scottish Winter Skills Week course cover? The course aims to cover all of the essential skills that you require in winter to be a self sufficient hill walker and enjoy this wonderful time of year safely and confidently. 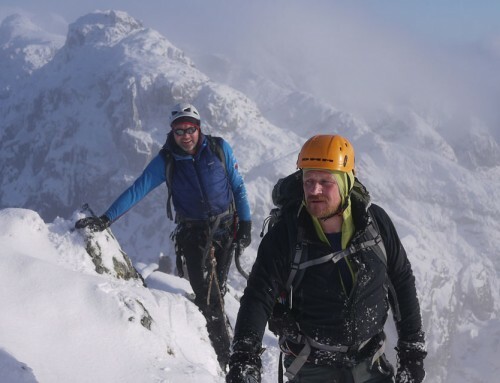 The big benefit of a 5 day course is that we will experience different snow types throughout the week which is really valuable from an avalanche avoidance and axe and crampon skills point of view. Each day we will use weather and avalanche reports to make route plans for that day. This helps you to develop your own self sufficiency. 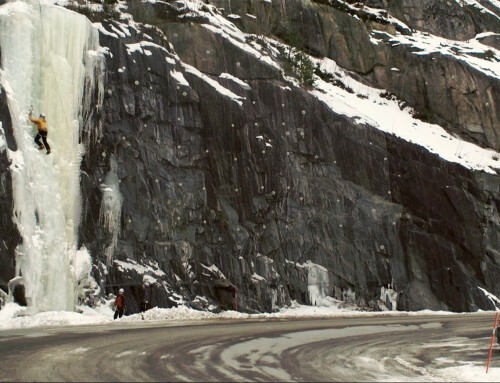 This first day concentrates on moving on snow, use of the axe and use of crampons if appropriate. We will probably use a chairlift to gain the snow line quickly and are likely to cover self arrest with an ice axe towards the end of the day. We will head out into the mountains to look at weather, snow and avalanche awareness including safe travel and route choices. We will progress your skills in using crampons and look at using the ice axe for cutting steps. We will also look at how we use the rope in winter to manage the risk of cornice collapse, winter navigation and approaching a scarp slope. As day two but with the addition of navigation for the winter mountaineer, emergency avalanche procedure ie how to cross a suspect slope, what to do if you see someone get caught & what to do if you get caught. We will head out into the mountains to look at weather, snow and avalanche awareness and choose an appropriate location to build emergency and planned snow shelters. 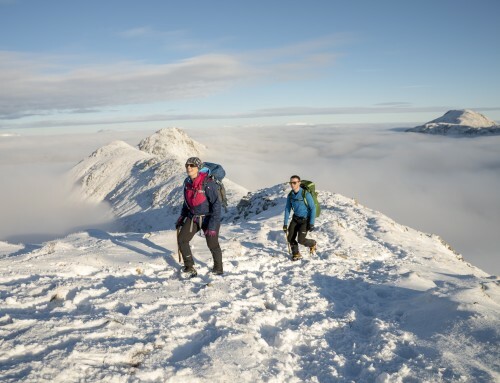 We will also take in some of the finest summits that the West Highlands have to offer dependant upon group fitness, options include Ben Nevis, Aonach Mor and many more in Glen Coe. We run the course in the Highlands of Scotland from our winter base in Fort William. We are very handy for Ben Nevis, Aonach Mor and Glen Coe and will often make the most of the ski centre chairlifts on the first day to maximise the time spent on the snow. Accommodation is not provided as this allows us to keep the course cost low and you can then arrange accommodation to suit your budget. I stay in Fort William and if you stay anywhere in the town you will be in walking distance of the house that I rent for the season (I am on the Glen Nevis Road in Fort William itself). Try booking.com or any of the price comparison websites for a range of accommodation options – there is always lots of choice in the winter months. The course is run by Rob Johnson and Huw Gilbert. We both hold the MIC, the highest instructional qualification in the UK. You can read more about our experience and qualifications here. Did you know there is no legal requirement for an instructor to have any qualification in the UK? People advertise all sorts of unusual titles so ask the question – are they qualified? The only qualification that allows someone to instruct in winter conditions is the MIC or the BMG. The Winter ML allows people to lead groups in the mountains in winter but it is not an instructional qualification. There is a mainline rail station at Fort William. You can also fly to Glasgow and there is a variety of coach and train companies and road links. This is not a winter climbing course, you do not need any climbing experience and we will not be entering into steep ground that would require the use of a rope. These courses are strenuous and you need to be physically fit to get the most from them. A little bit of training in the form of cycling, running or swimming beforehand will pay dividends! The course fee includes instruction and the use of any specialist equipment. You can read our kit list page here. We have a limited range of ice axes and crampons which can be lent out on a first come first served basis. If you are looking to buy your own kit for the course then this article I have written may be of help. When does this course run? We run this course from January to March – you can visit the diary page for all of our dates. Once you book we will send you a comprehensive set of course notes and a letter of confirmation, this will include a detailed kit list and details of where and when we meet. The first day normally starts at 8:30am in Fort William and finishes in the same place at about 5:00pm. If you have any questions that you can’t find answers to on the website visit our contact page for details on how to get in touch. We look forward to meeting you! To book this course please choose a date from the diary page and then click on the button below to complete our booking form and make payment via Paypal. We require full payment to secure your course space. Just wanted to say thank you so much for the last 5 days. I’ve loved every minute of it and have learned so much. Thanks for pushing me. Thanks for a memorable week of winter skills at the beginning of January. Your practical advice was always perfectly judged and I found the discussions of snow and avalanche risk particularly fascinating. More importantly, you conveyed and inspired a real love of the mountains as well. Thanks too for bringing the group together for five days of good company and good humour which will stay with me for a long time. I’d just like to say how wonderful our winter skills week went. Learnt a lot and feel more comfortable heading off to Sikkim for our track and climb. Your number two, Huw, has been an exceptional teacher and guide showing us the beautiful mountains of Scotland. It’s been beautiful weather here in Snowdonia and great to be back in the home mountains! I’ve been out with our intro to scrambling course today, up the Gribin Ridge and down Seniors. Ace!